For those of you interested in the writing side of DARK STAR, here’s some trivia about the book! — From original draft to finalized version, I went through four separate drafts of the novel. — Writing of the original draft took approximately four months. — The first completed draft was approximately 90k words; final draft is approximately 83k. *If you’re curious about why I didn’t query with any of the other novels: The first two were written when I was thirteen and fourteen, respectively. The third was the novel I wrote as my thesis in my MFA program, and I didn’t feel it was ready. — My music during subsequent drafts was much more varied, but the main song I listened to was Prayer for Beauty by Noe Venable (which is the song I most closely associate with Audrey). — I received my offer of representation from my agent on my father’s birthday. — DARK STAR sold on my mother’s birthday. — Though I rarely name characters after people I know, Gideon gets his middle name from my good friend Dave. — A certain scene in the book came from an idea I had as I was trying to fall asleep. I jumped out of bed and wrote it as quickly as I could. It became one of my favorite scenes—and is one of the scenes that had the least amount of revision! ← Just a quick note. 4 Responses to A bit of trivia. Thank you for reading! My mother was definitely thrilled to have my book sold on her birthday — she said it was the best present ever. The scene I jumped out of bed to write was Mickey’s first scene in the book (when Audrey does her reading for him). I had a very clear sense of their dialogue and how I wanted them to interact, and I didn’t want to risk losing that while I slept, so to the computer I went! You are such a amazing writer. I love the Dark Star trilogy. 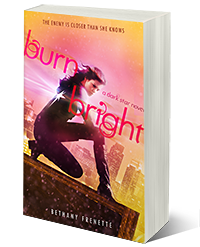 I am going to order Burn Bright soon and I can’t wait to get my hands on it. You are tired with my favorite author Marissa Meyer author of The Lunar Chronicles. Also cannot wait for Fire Fall to hit selves. Love your work. Bye!